I’ve been on a decluttering marathon the last 10 days. I began to follow the KonMari Method of tidying up after my own efforts stalled and I needed to jumpstart my resolve. The key to this approach is to keep only what sparks joy, unless an item is necessary. It reminds me of the Feldenkrais Method where, through multiple approximations, we learn to eliminate “parasitic” actions so that our movements feel pleasant and even elegant. In Feldenkrais, slow movements allow one to sense subtle differences between variations; in the KonMari method one is tasked with handling every object, even every photograph, a process that is not fast. What does not spark joy could be called a “parasitic” object, something that impedes or interferes with happiness. Marie Kondo, the creator of KonMari, insists that the best way to assess photographs is to empty the albums and pile the images on the floor. As someone who has kept albums and scrap books since I was a child, I balked at dismantling my painstaking hard work; to disturb my albums would perturb the history they contained and, along with it, my self-image. Each album told a story of some kind, with the photos or memorabilia in mostly chronological order. To disrupt these arrangements seemed as inconceivable as cutting up pages in a published book and reorganizing its paragraphs. Yet, I sensed Marie Kondo had a reason for this onerous approach. When viewed individually, rather than as part of a collection, it would be easier to tell whether a photo sparked joy or not. Once the images were removed from their original sequence and differentiated from each other, the mind would be forced to view them afresh. They could be arranged or rearranged to tell a more joyful albeit less thorough story, rather than the moment-to-moment chronicle of a trip or gathering that characterized my collections. Since I had so many images, I decided to sort them by album, rather than all together, at least at first. Still, as I reached for the first album, my chest clenched to such a degree that I almost backed off. Aware that part of me was either unhappy with or deeply fearful of this plan, I apologized aloud to my younger self for ruining her work and thanked her for celebrating and carefully codifying parts of my life. That prompted a deluge of tears. Back then, I imagined keeping these albums forever, sharing them with a spouse, and storing them on a shelf in a house so I could glance at them throughout my life, into old age. But my life did not follow such a narrative, and the volumes of pictures are weighty and occupy space, actual and psychological. As time accelerates forward, those memories recede into the background. Did I still want to devote room for them, in their current configurations? I spent the next umpteen hours extracting photographs from plastic album sleeves, a cuticle wrecking endeavor that seemed akin to a task Baba Yaga would assign to a young maiden. Yet once I got started, exhilaration and momentum built to the point that my fingers ached. Perhaps I had been itching to dismantle those albums all along and simply needed permission and a framework to mess with them. Sure enough, once the pictures were in a pile, they lost the fixity they had when meticulously arranged. When viewed individually, I saw that my photography skills and subjects of interest of decades past no longer sparked joy. Within minutes I eviscerated an album of a trip to Portugal in 1995, where I snapped pictures of painted ceramic tile without showing the context or even scale. Some photographs of me and my travel partner, a Hungarian friend, and a few city and nature scenes, survived. Still, they sparked joy that was relative to the other pictures in that album, not absolute joy. Even though both of us are smiling in the pictures, my friend and I had argued throughout the trip thanks to our divergent travel styles and unarticulated expectations. Yet, to throw out all the photos from that vacation seemed drastic, more erasing than curating, even though they don’t represent my fondest memories of the trip: eating simple but delicious meals in family run restaurants, not recorded on film. I halved the photographs I took during the 18 months I lived in Mexico; once I consolidated images from several small albums and camera store envelopes, I discovered that most were not worth keeping. To my surprise, I took great satisfaction in disassembling an album from high school, the edges of its once sticky pages now yellowed, and placing just a fraction of the images into clean plastic sleeves. Was I editing the past? Perhaps. Was this terrible? No. As I worked my way through the albums and piles, I pondered the sheer number of images I had kept or schlepped for years if not decades. As a frequent solo adventurer, it’s possible I took more photographs than folks who traveled in groups or couples, so that I’d be able to recall my trip after the fact. As someone who felt more comfortable behind than in front of the camera in my family of origin, I snapped lots of images during gatherings, not wanting to miss a key moment. Thanks to the free double print era, I still had duplicates, some filed in albums and others stuffed in boxes and envelopes. When my father passed away, I took many of the photos I found in his drawers, on shelves, in small albums and in boxes throughout his large house, adding to the volume and creating more disorganization if not chaos. Processing the collection reminded me of going on a day hike, where the initial exhilaration and enthusiasm is followed by more tempered delight at making discoveries and, then, when fatigue sets in, wanting it to be over already. As I consolidated and edited smaller albums filled with pictures that sparked joy or fondness, I wondered if and when I’d even look at them again; in another few years, for just a few minutes? At my age, would I be showing new acquaintances and friends photos of my youth, or had Facebook supplanted physical albums? 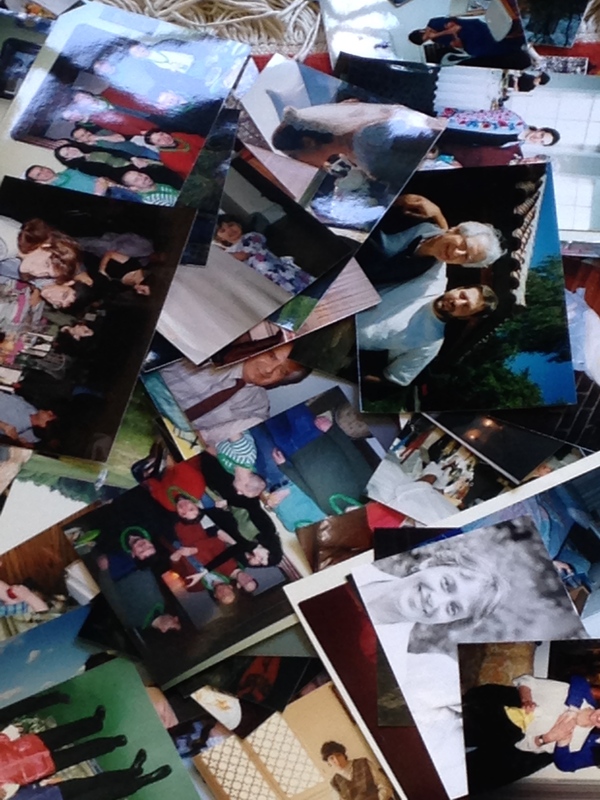 Briefly I considered throwing them all away, even the joyful photos. I wondered if they served a purpose or if I was keeping them out of an ingrained habit and cultural expectation. After piling the last group of images on the floor, pictures that didn’t fit into neat categories but that spanned decades, I became saturated to the point that the past was beginning to lose its customary fascination. In scanning the pile for some favorite photos I wished to keep, I realized I had more of a relationship to some of the images than to the moments in which they were taken. What was more important now? The photo, or the occasion itself? Without the photo, would I even remember the event? And if I didn’t, would that be a problem? Were the memories provoked by the photos accurate? Even at my college graduation, which I don’t recall enjoying, there are some pictures where I am laughing and appear to be having a ball. I’ve kept those prints and tossed some candid shots where I seem preoccupied if not melancholy, which is truer to the majority of my lived experience and to my memory of that event. I suspect that as I continue practicing Feldenkrais I’ll make further edits to my photo collection. As my self-image evolves, I imagine the images I choose to keep will change, too. Perhaps, eventually, I will have distilled each event or trip to a handful of pictures, or maybe just one. To paraphrase Moshe Feldenkrais, his method doesn’t change the past; we still keep our old patterns but, having created new pathways, we can now choose which to use. Marie Kondo claims that people who follow her method change their life and don’t revert to old habits. It’s a bold assertion. I’m not sure I believe it, but I’m curious to see where this process, like a Feldenkrais Awareness Through Movement lesson, will lead me. *After publishing this post, I perused the few pages I had kept from my summer camp yearbooks; one year I was referred as “the new road runner.” I’m wondering what happened my inner runner.